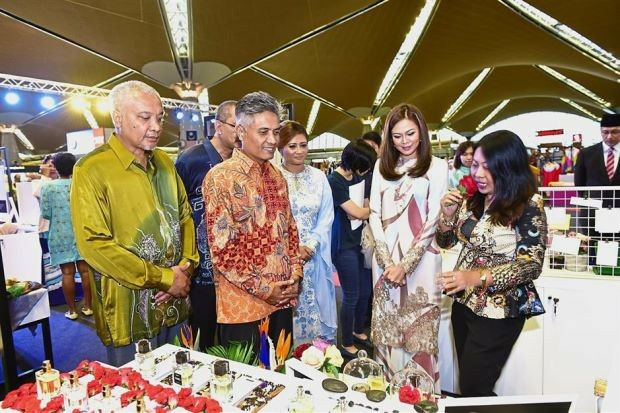 MALAYSIA Airports and Malaysia Design Development Centre (DDEC) have combined their resources to launch Himpun, a month-long campaign at KL International Airport (KLIA) to showcase the best of Malaysian fashion, craft, delicacies and beauty products to a global audience. Launched by Tengku Permaisuri Selangor Tengku Permaisuri Norashikin, the campaign’s introduction was in celebration of the country’s National Day and the upcoming Malaysia Day on Sept 16. To enhance its symbolic significance in featuring everything that makes up the country’s pride, the theme was aptly coined “Proudly Made by Malaysians”. According to Malaysia Airports and DDEC, Himpun’s objective is to provide local and international travellers at KLIA a cultural perspective of what a beautiful country like Malaysia can offer through the products and activities showcased during the campaign. “We are obviously very excited to collaborate with DDEC again to introduce yet another innovative campaign which I am confident will add value to customers or travellers’ shopping experience at KLIA. “Creating a joyful Malaysian experience for travellers is central to what we do at Malaysia Airports. With millions of travellers passing through KLIA each month, campaigns like Himpun will enhance the ‘total airport experience’ and offer a ‘sense of place’ for travellers – where every interaction at our airports becomes an experience to savour the richness of Malaysian culture that is both positive and unique,” added Nazli. DDEC chief executive officer Abdul Rahman Mohd Saad said, “The campaign will provide an opportunity for Malaysia-lifestyle SMEs to promote their products in KLIA, enabling their brands to have wider exposure on both domestic and international levels. “Additionally, this event will enable Malaysia Airports and DDEC to jointly assess the commercial viability of the participating brands with a view to potential future retailing activities at KLIA,” added Abdul Rahman. The Himpun campaign will run until Sept 30 with live cultural performances, fashion talks and product demonstrations held daily. Some of the more popular local brands showcased are Asian Potions, Eartheir, Frankitas, Fernthenewbatik, andMySmink. The campaign also gives travellers a chance to take a piece of Malaysia’s rich cultural heritage home when they buy artisanal products proudly made by Malaysians.